For the final project for Georgia Tech's ECE 4175, by teammate and I decided to make a Bulbdial-like clock. It can be called an "artificial sundial" of sorts. Lights around a center post shine onto it, and the shadow of the post makes the hands of the clock. The original bulbdial does something smart, and uses charlieplexing to handle the large number of LEDs (for n pins, they can have n(n-1) LEDs running on them). However, we have project requirements to fulfill. We have to use an SPI device as part of the design. So we thought might as well go all in and drive each channel independently with a massive shift register. 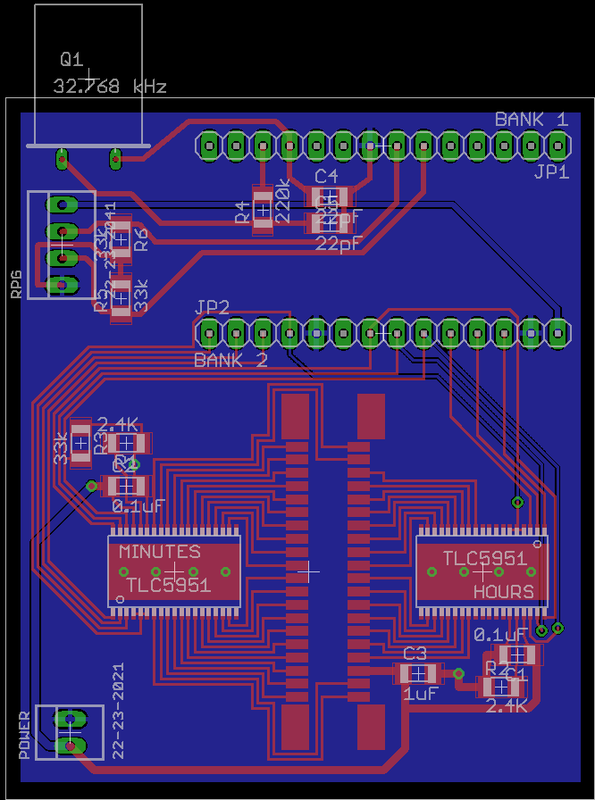 We decided on Texas Instruments' 24 channel LED driver, the TLC5951. Two of them, so we can have 24 minute hand positions and 12 hour hand positions for a total of 36 independently driven LEDs. Sorry, no second hand, or we will go crazy laying out and wiring them all together. The benefit of this design is that all LEDs can be lit at full power, for alarm clock functionality or something. The downside is that there are a lot of wires. After some layout wrangling, its a board! The EAGLE files can be found in the links below. And, that's about as far as I have gotten. Soon, once I check some things with my professor, I will send the board to fab.